Smart: A cure for America's addiction to oil? 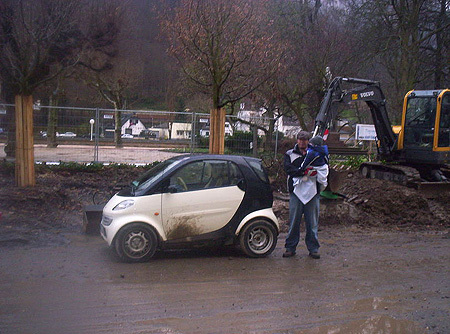 March 7, 2006 | With gasoline prices soaring out of control and the development of alternative energy sources moving at a snail's pace, small cars may be the way to go. I went to Germany over the recent winter break to visit my father-in-law who was recovering from throat cancer at a rehabilitation center in a city called Bad Emms. I spotted a tiny car known as the Smart fortwo while we were walking through the streets of this beautiful German resort city, located near the border with France. In order to give some perspective to how small this car really is I had my picture taken next to it. According to Wikipedia it was designed to transport "two persons and a case of beer." My wife, Tatjana Givens, is from Germany, she said some Germans have nicknamed the Smart fortwo, Elefant Rollstuhl, which translates into "elephant wheelchair." In Europe small cars are a lot more common than they are here in America with many manufacturers building models for the European market that we will likely never see here in the states. The popularity of small cars is primarily due to the high cost of gasoline. Monika Strampfer, who lives in southern Germany near Nuremberg, said in a phone conversation on Feb. 24, 2006, that gasoline currently costs 1.19 Euro per liter. At the current rate of exchange that equals about $5.37 per gallon. It seems like cars in the U.S. just keep getting bigger, take for example the Hummer H-2. "Americans are addicted to oil," said President George W. Bush in his state of the union address Jan. 31, 2006. The Smart fortwo gets approximately 60 miles per gallon making its driver more like a social drinker than a full blown addict. SMART is an acronym for Swatch Mercedes Art. In the beginning Smart was a project between the Swiss watch maker Swatch and the German auto manufacturer Mercedes. Swatch is no longer involved they pulled out due to heavy financial losses. Smart is now a division of Daimler Chrysler the owner of Mercedes and many other automobile brands around the world. Smart manufactures compact cars which are popular throughout Europe and Asia they also seem to be available pretty much everywhere except the United States. However, they are sold in Canada and technically you could import one yourself if you so desired as long as it met current U.S. safety and emission standards. Smart currently has two models, the original fortwo and a four passenger model the forfour. Due to low sales they halted production in 2005 on a Roadster model, which was designed to be reminiscent of a 60s era roadster. Smart also scrapped production plans on a model named the formore which was a small sport utility vehicle destined to be released in America. The first Smart fortwo, originally called the City Coupe came rolling off the production line in Hambach, France in July of 1998. They still make the four two's in Hambach at a factory named Smartville. The forfour is produced at a factory in the Netherlands. According to the Smart Web site their cars are loaded with safety features pioneered by Daimler Chrysler such as the tridion safety cell, a high tensile-steelsafety structure designed to protect the occupants. It also has crumple zonesthat help absorb impact energy and dissipate as much as possible before it reaches the tridion cell. The cell helps to reduce the energy of impactbefore it reaches the passengers. All Smart cars come equipped with many of the same safety features found on Mercedes automobiles such as front and sideair bags, anti-lock brakes and what Smart calls electronic stability program or ESP. ESP helps the driver during cornering, stabilizing the car byadjusting engine torque and selectively braking one or more of the wheels at a time as necessary to maintain lateral stability, the web site said. The starting price for a Smart fortwo in the United Kingdom is 6,810 pounds, which according to the current exchange rate equals about $11,869. When you purchase a Smart you're essentially getting all theengineering and quality of a Mercedes for less than what you would pay for a Ford Focus stateside. According to Wikipedia that's probably the reason why they're not availablein the states just yet, Mercedes wants to maintain its reputation as a highpriced luxury line in order to keep high profit margins. Smart's Web site said they plan on exporting their cars to the U.S. but as of yet it's too soon to determine when that will begin. With the price of gasoline these days and increasing concerns aboutgreenhouse gasses, Smart may be more than just an acronym, it may be a "smart" choice.